The best thing in "Iron Man 2" is Samuel L. Jackson's Nick Fury. The next best is Scarlett Johansson's Natalie Rushman. (Pretty impressive the education someone can get in law school these days, and Latin's the least of it.) 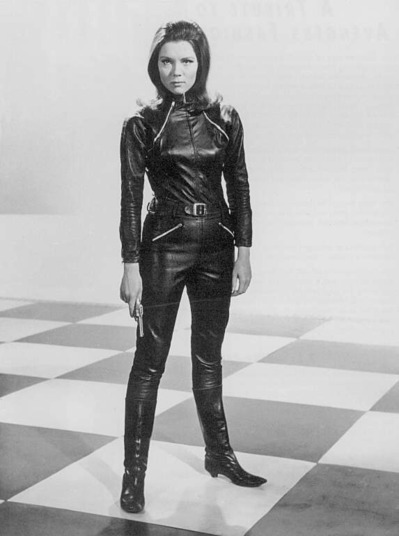 Natalie, or at least her martial-arts prowess and affinity for tight-fitting black actionwear, summons up memories of a certain other highly kinetic heroine, Diana Rigg's Emma Peel, of "The Avengers" -- the British television "Avengers," not the dreadful movie version (with Uma Thurman as Mrs. Peel), or the Marvel comic in its various guises. Just about the final thing we see in the movie is a folder with the words "Avengers Initiative" stamped on it. This relates to the Marvel comic series. It also sets up " The Avengers" movie that's supposed to come out in 2012 (and which, depending on how you look at it, does or not qualify as "Iron Man 3" since Robert Downey Jr. is top billed as Tony Stark). Some of us, at least, might also like to see it as a nod to Dame Diana back in the day. Although our heart belongs to Emma, it must be said that Natalie has it over her predecessor in at least one respect. Coiffure-wise, losing the flip is a major improvement.